It has been agreed that the seller will pay for transport and will remain responsible for the goods until they arrive at the buyer’s depot. However the buyer will unload the goods from the truck and clear the goods for import, paying any necessary duty. 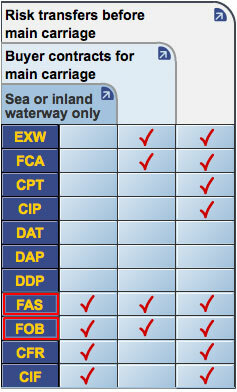 Which Incoterms rule should be used? Move your mouse over a box below to check your answer. Correct answer is “Delivered At Place”. The seller’s responsibility ends when the goods are available on the arriving conveyance, ready for unloading (but not cleared for import). In Delivered At Place, the seller’s responsibility ends when the goods are available on the arriving conveyance, ready for unloading (but not cleared for import).